Michael Bostwick looks to get past Courtney Wildin. Ryan Tafazolli’s first-half header saw Peterborough United earn a 1-1 draw at Boston United in the opening pre-season friendly of the summer today (July 3). Tafazolli has been signed to bolster one of League One’s leakiest defences, but his scoring record for Mansfield from set-pieces has also been noted by new manager Grant McCann. Ryan Tafazolli heads home the opener. Only by employing Harry Kane to take corners could Posh possibly have been any worse at set-plays in recent seasons so Tafazolli’s downward header from Marcus Maddison’s delivery seven minute sbefore the break was a highlight of the game for the visitors, along with the calm composure of 16 year-olds Cameron Gow and Lewis Freestone. McCann says results in pre-season game are irrelevant and he’s right. Just as well really as a draw against a team from three divisions lower in the Football League ladder wouldn’t otherwise have been deemed satisfactory. But the first-half team bossed the game at Boston and there were glimpses of quality from the second-half side, most notably after a fine piece of control and finishing from Lamin Colley delivered the home side’s 67th-minute equaliser. Jon Taylor blazed over 11 minutes from time and Shaquile Coulthirst was thwarted by a fine save from Christian Dibble, son of former Posh coach Andy, moments later. 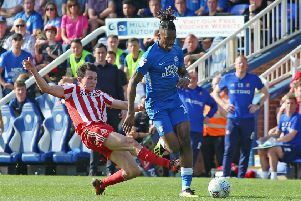 Michael Bostwick had been a whisker away from blasting Posh into an 18th-minute lead and Joe Gormley was twice denied a goal on his comeback from a serious knee injury, first by Dibble and then by defender Joe Maguire following a lovely backheel from Maddison. Dibble was at fault for Tafazolli’s goal as he missed an attempted punched clearance, but joy at that moment was tempered almost instantly by an ankle injury that forced striker Lee Angol off the pitch. Boston improved in the second-half and Posh ‘keeper Ben Alnwick had to react smartly to keep out a Lewis Hilliard curler. Colley also fired a volley just over the bar before a terrific Adil Nabi dribble was foiled splendidly by Dibble. POSH: First half: Henry, Beautyman, Hughes, Bostwick, Tafazolli, Gow, Da Silva Lopes, Chettle, Maddison, Angol (sub Coulthirst 40 mins), Gormley. Second-half: Alnwick, Freestone, Baldwin, Almeida Santos, White, Forrester, Inman, Taylor, Nabi, Nichols, Coulthirst. BOSTON: Dibble, Thomas (sub Williams 46 mins), Wildin, Pepe-Ngoma, Maguire, Brown (sub Green 31 (sub Johnson 73), Roberts (sub Rollins 46 mins), Burgess (sub Hilliard 48 mins), Fairhurst (sub Colley 46 mins), Marshall (sub Lavelle-Moore 46 mins), St Juste (sub Chippendale 46 mins); Unused subs: Emery, Adams, Ofosu, Linley. Goals; Posh - Tafazolli (38 mins). Boston - Colley (67 mins).